I decided to make my own – a garland I could pull out year after year. 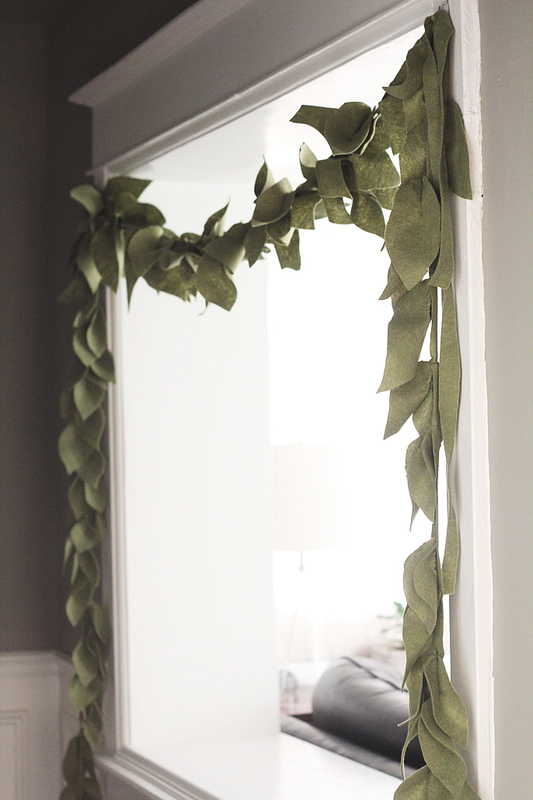 I couldn’t find any similar projects or tutorials online so my “how to” tutorial here is really a lot of “I tried this, and I tried that” and there is no formula for the perfect garland. But that’s ok, as I think the less you follow instructions on this one, the better it will turn out. What you basically do is layer on the leaves, one over the other, on a strand of felt that you’ve cut to the length you want. Layering, layering and more layering of leaves all in the same direction – eventually you’ll end up with a fluffy strand of felt leaves that you can hang in your home. Leaf SizeThe bigger the better but get some smaller ones in there to fill bald patches and also for variation. I didn’t use a template – really, the more “imperfect” the leaf the better in my mind. This was where I had trouble figuring out what was the best way to do it – every strand I did, I did it a different way. It’s likely easiest to work from the bottom and layer your leaves as you go up. Between sewing leaves on, fluff it out and see how it is looking. I have been searching everywhere for this color of felt too! It’s perfect but impossible to find!